Throughout American history -- and as recently as the 1950s -- there were no unions for government workers. Public-sector employees were expected to earn a bit less than their private-sector equivalents. The reasons they did so included an interest in public service, job security and reasonable benefits. But that changed in the late fifties with New York City Mayor Robert Wagner's cynical appeal to the votes of city workers. He signed an executive order authorizing them to unionize, and soon other local and state Democrat legislators around the country followed his lead. These efforts culminated in 1962, when President John F. Kennedy granted federal employees the right to collectively bargain. 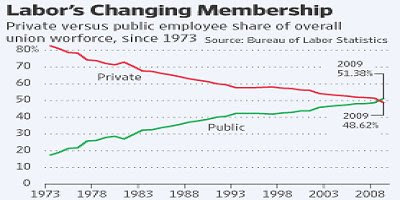 Since then, public sector union membership has skyrocketed while, in the private sector, unions have fallen out of favor. In 2009, private sector union members were outnumbered for the first time by their public sector counterparts. The historical basis of unions revolved around workers receiving a reasonable share of a company's profits. But that tenet is nonsensical when applied to public service. Governments don't make profits; they simply assess taxes. The aims of public sector unions conflict directly with the interests of taxpayers. And because it has been exceedingly hard to fight public sector unions, the salaries and benefits of public employees have skyrocketed in recent years. Since the election of Barack Obama, the number of federal employees making over $150,000 a year has more than doubled to over 10,000. In 2009 government salaries jumped 2.4%, approximately twice the increase earned by private sector employees. In fact, the average salary of a federal worker is now $71,000, about $22,000 more than the average private sector employee. Worst of all, public sector unions have negotiated pension plans that are proving financially untenable. Many allow workers to retire at age 55 at around their full salary in their final years of employment. These pensions often include inflation adjustments as well as lifetime free health care. These plans are so outrageous that state retirement systems, for example, are currently underfunded by about a trillion dollars. So how have public sector unions achieved these amazing results? The answer is hundreds of millions of dollars, the approximate amount that unions have contributed to federal campaigns since 1990. Almost every dollar went to Democrats or Democrat causes. In the 2008 election alone, some estimates put public sector union contributions to Democrats at $60 million. These unions are also astroturfing for Democrats, providing slush funds to help liberal causes. An example is ThePartyIsOver.org, a faux populist website designed to discredit TEA Party activists. The Democrats' health care bill, the 'Employee Free Choice Act' and the $800+ billion stimulus bill all contained payoffs to public sector unions. In fact, while the private sector has shed 7,000,000 jobs since the recession began, the number of public sector jobs has risen every month. Public sector unions are killing our economic system and the American taxpayer. The debt unleashed by their outrageous benefits plans simply cannot be paid. The union bosses have lied to their members about lifetime benefits and they have betrayed the American people. Public sector unions must be disbanded and outlawed before our country resembles Greece, Spain and other European countries that are teetering on the brink of destruction, thanks to unions just like ours. Based upon: Amy H. Laff, StateBrief. Linked by: Boortz.com and The Washington Examiner. Thanks! Here are a couple of facts about the Indiana Public Employees Retirement Fund and the Indiana State Teachers Retirement Fund. About three years ago, PERF was funded at 99%. After the Fall 2008 economy problems, it now is funded at 93%. PERF is not unionized. However, the teachers' retirement fund has been flailing forever and not too long ago was taken over by the NEA. The public sector unions are so powerful that they can force California to keep spending beyond it's means. The private sector can easily layoff workers but the unions now run to the courts to stop furloughs and layoffs. The city of LA is struggling to reduce the workforce since the City Council refuses to cooperate. The state is bankrupt and will have to issue IOU's again this year. I have always wondered why people whose salaries are paid for with taxpayer dollars were ever allowed to unionize. I mean what type of "poor OSHA-violating work conditions" could they have to warrant a union? These unions have become way too powerful and they do not represent all of their members any longer. A very good account of the history of unionism in our country. In addition to their gridlocking effect on our public (government) efficiency, they have surely had a most drastic effect on our car companies, leading them into bankruptcy and goveernment takeover and control. The good that they did at the beginning is completely overshadowed by their change in focus from the worker to political advocacy. Okay, understood and in agreement. Now a question. What would be the process for disbanding public sector unions? the union is a business that looks out for it's dues money first and really what does the individual members get...they get to be members supporting corrupt union bosses. This study is extremely misleading. The vast majority of public sector employees have much higher education and qualifications. You need to compare apples to apples. A study from the University of Syracuse found that when you compare public and private sector employees with equal qualifications, private sector employees earn between 4.6 to 6.6 less. 1) The problem with studies like this is they generally count only University accredited courses, and ignore things like Comptia certifications, trade school education programs, and the lot. 2) it's not really about who's more educated, it's about the market value of what is being done. you should not be rewarded for being overeducated for a position. In the private sector, you would have to seek a position more in line with your qualifications. 3) studies like this also tend to be nothing more than a degree count, without calculating difficulty of the degrees in question. the public sector has a lot of doctors and engineers; more by the percentages than government. These degrees are a lot more marketable and valueable than social workers, MBAs, and even Teachers. I'll keep it short. If you're going to compare the unionized public sector raises to anything, you have to compare it to unionized private sector raises. If you compare union to non-union anywhere, you'll get the same disparity. For over 100 years, pro-union activity, with culpability by academia and the legal system, has resulted in a 'cost basis' (for doing work) that is higher for the US than for the rest of the world. If cost bases were equal, the US would have every job - we're that efficient & productive!! When unions reflected their ancestral values - guild/craft pride in quality of trade/product - those concepts were noble. And, their contributions to workers' safety cannot be denied. Today's public and private-sector unions do not represent those "old" values & traditions. Now, it's all about the money. GREED!!! I am very pro-union in the private sector. Nothing wrong at all about pooling labor and then using it as leverage. Companies that engage in joint marketing, development, manufacturing and so forth are being good "capitalists" and yet when employees do it somehow that magically becomes socialist. However, when it comes to public employee unions I can't help but to ask myself exactly who is it they are unionized to protect themselves against? Who is the enemy that requires they leverage their labor pool? The answer is in their very name of course - public employee union. Mr and Mrs America, you are the enemy. How do we really expect someone to view themselves as a public servant when they start off with this attitude from Day One of their supposed public service?